Attending to customers is always the FIRST priority over anything else that you may be doing (the only exception would be if there’s a safety issue). Clarify to them if there may be a delay while you finish serving another customer or you will be with him or her shortly. Let customers know that you will bring their food. Tell customers that you will come back to check on them (essential for those opening a ticket/tab). Try your best to identify customer dissatisfaction BEFORE it’s articulated to you. Customers rarely complain so look for signs that they are unhappy (I.e. uneaten food) and ask open-ended questions. Customers order at the counter or sit at the bar. Ensure that the customer prefers partial service (I.e. they want to pay right then and close their ticker/tab). You can use your intuition on this or ask if you are unsure but most times it will be obvious. Utilize table numbers any time that there’s more than just a couple folks and if you need to deliver something to the table. When packaging and delivering food and drink, provide all necessary utensils & accompaniments. Don’t wait on the customer to ask. Clear the table number when you make the final delivery to the table. If table numbers remain on the table it’s a signal that something still needs to be delivered OR that they have an open ticket. Let customers know that you will collect their dirty dishes. And thank them if they clear their dishes on their own. Customers can order from their table, at the counter (initially) or sit at the bar. Assume that the customer wants full service unless it’s obvious that they are just placing a one time order. If a customer approaches the counter to place an order let him or her know that you will be delivering to the table and that you will be following up with them at their table. If customers sit at a table or the bar, approach them and assume they want full service. Start a ticket for all full service orders (plus a ticket/tab needs to be started for all alcohol orders). If a customer is getting full service he or she should never have to approach the register or bar again to ask for a refill or to request the bill. Check back with customers frequently. This can be as simple as walking by slowly, clearing items from the table, or making eye contact to ensure that they have the ability to easily request something else. If a drink is at 1/3 full or less (AND you know that it’s safe to offer him or her another drink - REMEMBER your STAR training!) ask if he or she would like something else. OWN YOUR ZONE! (BAR, CAFE TABLES, PATIO) and work it walking through regularly smiling and asking if people need another drink or anything else. Our posted hours are our service hours (when we accept orders). These are not our lock-the-door hours. Employees will be scheduled to start prior to our opening time to be ready to take orders at our open time and will be scheduled after our posted closing time to allow for customers to finish their meals and to clean up. No customer should be refused service during our posted hours even if walking in the door exactly at the last service time. Make sure all customers get necessary utensils and a few napkins. Employee Feedback Form - please review to better understand expectations. 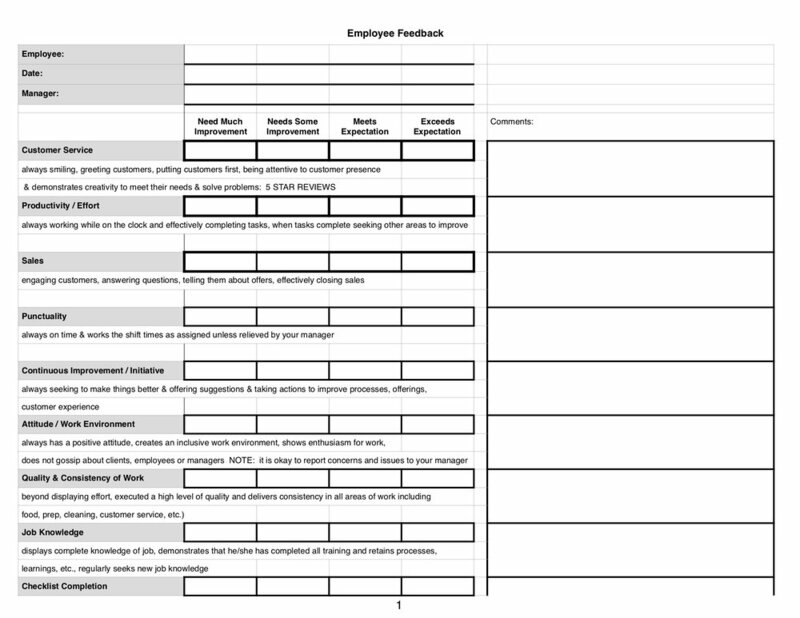 We utilize this form to provide ongoing feedback and dialogue to employees. Thank you! Your acknowledgement has been recorded.